Aries Ingress 2011-The Burning Bush is Comming!! Contestation!!!! who’s right and who’s wrong?? You, me, them or just my ideology!!!! The United Nations meet to vote on authorised air strikes. March 17, 2011 @ 18:00hr EDT, Manhattan, New York, Voted on @ 18:25hr. The Security Council has authorised air strikes to halt Gaddafi’s offensive against embattled rebel forces in the Libya. 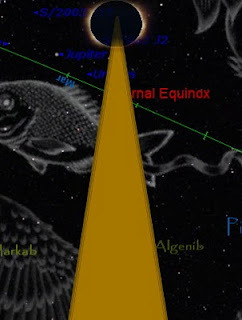 The Chart for the commencement of the vote has 15 degrees 03’ of the Image Virgin/Virgo rising. The ruler is Mercury, which is in the Image of Ares/Aries. The Descendant which represents the Vote, Pisces/Two Fishes, 7th house, the lord is Jupiter. Jupiter is co-joined to Mercury in the 8th house of Loss (Death of something). 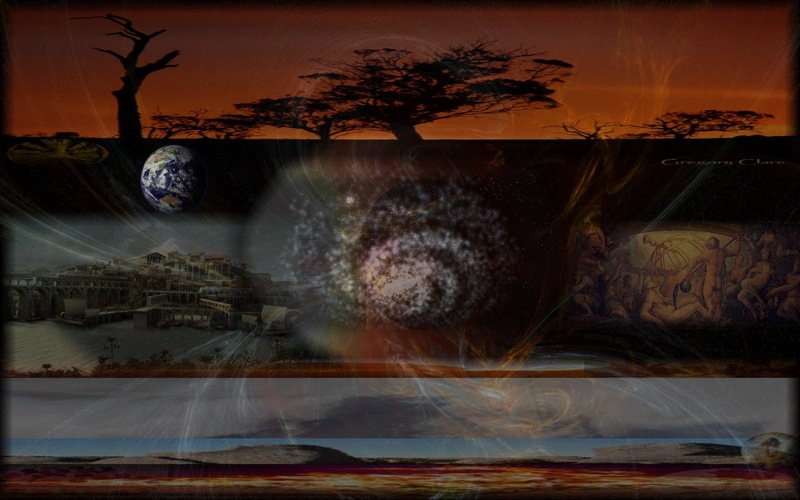 Mars the Mundane planet of War is in a Mutual reception with Jupiter and is on the Angle of the descendant. The Lord of the 6th house, Military forces is retrograde Saturn in the 2nd, diametrically opposed to Mercury/Jupiter. This is showing not all are in agreement with this action. A crucial moment will come on March 30th, 2011 @ 20:47:35 GMT. Mercury the chart ruler will Station. At this Moment in Time...... Jupiter will be in exact opposition to Saturn. Adding to this will be the Event chart Moon partile joined to Neptune at 29 degrees in the Image of the Water Pourer/Aquarius. The lord of the Water Pourer is RX Saturn. The Vernal Equinox is on March 20th 2011 @ 23:20:43 GMT, Greenwich, UK. This chart has the Scorpion rising with the Lord of the Ascendant Mars co-joined to the IC. This MC/IC Axis is almost the same degree rising as the UN Vote chart. The Ingress Moon has just moved off Saturn and is in direct opposition to Mercury. A Tyrannical battle of Words with Loss and Separation/Isolation!!! This is not a good outlook, and is reinforced by the Descendant degree, 25 Taurus. This degree is one short of the Fixed Star Algol, the Gorgon Medusa. Heads of State will be held accountable as ‘Peruses Slays the Beast’ sinking into the Abyss. Moments of uncertainty have arrived!!! The Tale of two fish! This lunation is about to climax!!!! Tick Tock... The Tolling of the bells will ring out!!! The uncertainty I speak of may be very evident on March 17th 2011. ‘The finger of Yod’ is pointed???? North from where I stand!! How precarious life is...we pray for the lost. Uranus enters into the Image of the Ram (Aries)! 7 years of unpredictable, untameable, ingenious, inventive and impulsive Fire. 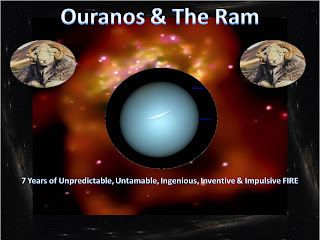 On May 28th 2010 @ 02:44 BST Greenwich, UK, Uranus made its first passage into Aries, only to retreat back into Pisces in August 2010 and then re-emerge in The Ram on March 12th 2011, for 7 years. Anu - Kumarbi - Teshub- Hittite Gods - were equated with the Greek Ouranos, Kumarbi attacked his father Anu and deprived him of his man-hood, which falling upon the Earth Goddess Ge, made her pregnant, from where we get the child Aphrodite. This is a very similar story told by the Greeks, Ouranos we are told is the God of the Heavens and is married to Ge (Goddess of Earth) and is the so called father of the Titans. Ouranos is attacked by his son Kronos who severs his man-hood, which then falling into the sea creates a mass of foam (aphros). This action initiates a consummation in the sea – from which the Nymph- Ourania or ‘Heavenly’ Aphrodite, known to us as Venus emerges and steps on to the Land at Paphos in Cyprus. So the apparent story line of Uranus the Kingly Sky God is one of sudden severance by his son. What will this unpredictable Planet have in-store for the Collective and more importantly have in-store for you personally??? When we look at the discovery chart for Uranus by Sir William Herschel, 13 March 1781, we begin to understand this Hermetic Cipher. Saturn and Mars are co-joined in the Archer (Sagittarius) opposing Uranus in the Twins (Gemini) and the Sun completes a T-square in the Two Fishes (Pisces). Saturn – Ignorance and rejection, Mars –Separation - severance, the Sun -The Leader. 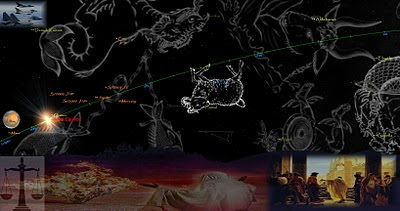 When we put this together we get Revolutionary (Gemini – brothers of Knowledge) violence aimed (Sagittarius- the Archer from a foreign land) at the Leader (Pisces – Serene philosophical judgments). But this does not always have to turn into violence as Uranus is holding the Collective knowledge of the Heavens – Universal Love. (Brothers in Arms). Clyde Tombaugh confirms the existence of Pluto and Artificial nuclear fission is confirmed. 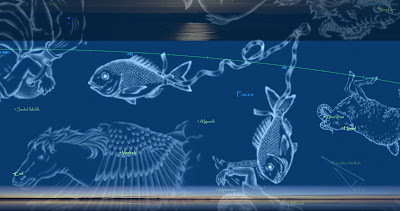 On Friday March 4th 2011, there is a new moon in the image of the Two Fishes (Pisces). This Lunation contains a stellium (Lots) of planets linked hand in hand. The waters a full, which way do you swim? Torn between sacrifice and service, the waters are muddy. Empathy and compassion are colliding with chaos and disorder in the rivers of confusion challenging our beliefs. Perplexity and bewilderment is written on the faces of the lost. A sense of calm, serenity surrounds those who look upon the waters with composure. The Martyr will call out as he/she sinks into the Abyss drowning in sorrow and eventually lost into the muddle still night. To be born again! The cycle goes on.